Notes: Developed by Guide Tom Loe of Crowley Lake, CA of Sierra Drifters. The Spruce-a-bou was designed to imitate baitfish that inhabit the Eastern Sierra, particularly sculpin and squawfish. Tom suggests using a moderate to full sink tip or a full sinking line within most of the Eastern Sierran streams with this fly. 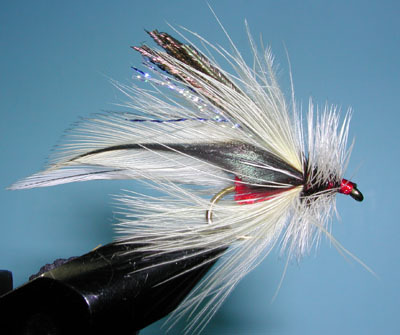 The fly is pulled along the bottom with erratic strips using a downstream sweep. Mend the line upstream to allow the fly to sink. Pull the fly upstream with 4-6" tugs along the bank or seam. 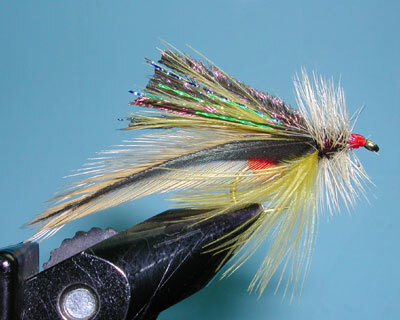 The flies are available at many fly shops such as: Crowley Lake Fish Camp, The Troutfitter, The Trout Fly, Malibu Fish N'Tackle, San Diego Fly Shop and StroudsTackle. The colors that Sierra Drifters have recommended are Ginger and Golden Olive.